Despite the bitter cold, many stayed behind to share thoughts and memories. A replica of the Gospel of Saint John given to every soldier serving in WW1. 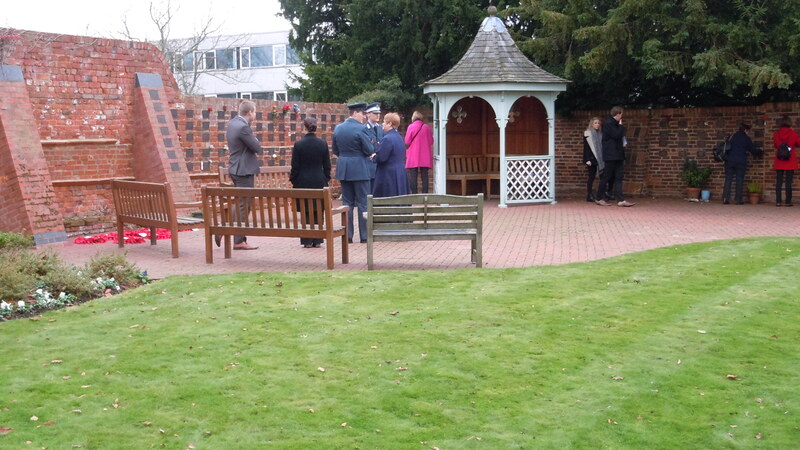 Each year the Centre for Faith and Spirituality at Loughborough University holds a Remembrance Service in the Garden of Remembrance on campus. Here, not only those who died in armed conflict are remembered but also those students and staff who have plaques dedicated to their memory in the garden or whose names are written in the ‘Book of Remembrance’ in the University Chapel. 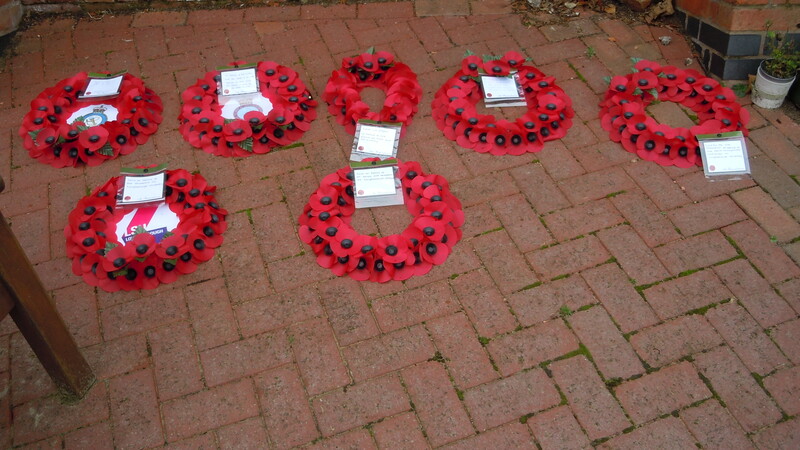 Wreaths are laid during the service by representatives from the military and the university, and these are then left on display. Recently, the wreaths from the past few years were collected in and rather than being thrown away, have been dismantled and used to create an indoor display in the foyer of the Brockington Building. This display was inspired by ‘Blood Swept Lands and Seas of Red’, the commemorative art installation at the Tower of London designed by East Midlands’ artist Paul Cummins and RSC stage designer Tom Piper. This national commemoration features 888,246 ceramic poppies – one for each British military fatality of WW1 – which were made at Cummins’ studio in Derby and ‘planted’ into the Tower’s moat by volunteers. In Brockington, textile artist and Free-church chaplain Jo Leatherland glued poppies onto a black backdrop which has been fixed to the wall and cascaded out over the floor. Many of the poppies were worse for wear and dirty from being outside for several years but have been left as they are to signify the messiness and disruptiveness of war. The word ‘Remembrance’ laid on the carpet at the front draws people in to stand and contemplate the display. The CFS is a place for quiet reflection or meditation, with chaplains available to offer a listening ear and spiritual support to staff and students of all faiths and none. 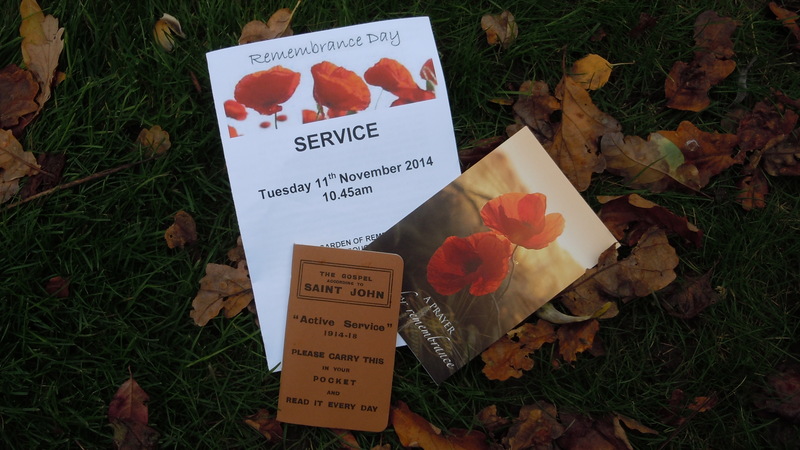 Their Remembrance Service for 2014 was held on Tuesday 11th November at 10.45 am in the Garden of Remembrance (adjacent to the Bridgeman Building). 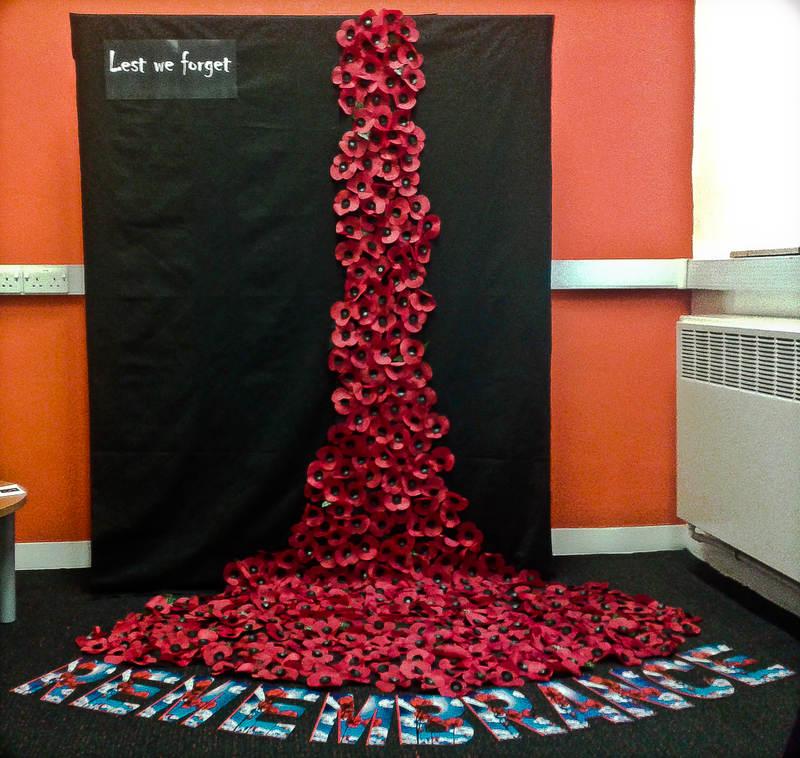 The poppy display can be seen in the CFS foyer in Brockington Building until 18th November. Inspired by the imagery in John McCrae’s poem ‘In Flanders Fields’, American professor Moina Michael wrote the poem ‘We Shall Keep the Faith’ in November 1918 and vowed always to wear a red silk poppy as a symbol of her remembrance. She soon realised that the making of artificial poppies could provide financial and occupational support for disabled ex-servicemen and after she wore a poppy at a conference in Paris in 1920, the idea quickly spread across the US, the UK, Canada, Australia and other Commonwealth nations. Field Marshal Douglas Haig, the founder of the Royal British Legion, adopted the idea and in 1922, the Legion gave a grant of £2000 to The Disabled Society to establish The Poppy Factory in Richmond, London. The factory employed 50 disabled veterans, with a waiting list of many more, making a million poppies within its first two months. The company relocated to its present location in 1932 and now makes 36 million poppies a year, as well as poppy wreaths, wooden crosses and other tokens of remembrance for services across the country. In March 1926, Lady Haig’s Poppy Factory was opened in Edinburgh at the suggestion of the Field Marshal’s wife. The company is now an independent charitable concern and makes approximately five million remembrance poppies a year. White poppies were introduced by the Peace Pledge Union in 1934 as a pacifist statement which commemorates the dead whilst symbolising an objection to war itself. In November 1938, following an ‘alternative’ remembrance ceremony in Regents Park, 3000 peace activists marched to the Cenotaph and laid wreaths of white, as well as red and white, poppies. The sale of white poppies is said to have peaked in that year, with an estimated 85,000 sold. According to the Royal Canadian Legion, people should wear their poppies on the left lapel, as close as possible to their heart. Read an article from the Imperial War Museum on why poppies are worn on Remembrance Day. See some stunning photographs of the installation at the Tower of London. Read the controversy surrounding the display and hear designer Tom Piper defend his First World War artwork. Discover how the first celebration of peace and remembrance in 1919 was also a subject of controversy. Find out more about the Centre for Faith and Spirituality.